Fred. Olsen staff joined together and dug deep in their pockets at their ‘Summer Ball’, held at Woolverstone Hall, Ipswich, Suffolk, to raise over £11,500 for their three chosen local charities for 2018/19 – Ipswich Winter Night Shelter, Alzheimer’s Research UK and Apostleship of the Sea. Each of the three local charities will receive nearly £4,000 from this one event alone. Fred. Olsen’s ‘Summer Ball’ is organised every two years and is attended by staff from throughout the Fred. Olsen Group. This year, the event held special significance, as Fred. 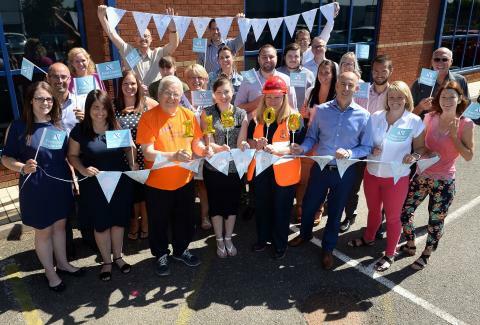 Olsen celebrated 30 years of being based in Ipswich. The highlight of the Fred. Olsen ‘Summer Ball’ is always a ‘Grand Charity Raffle’. Prizes on offer this year included exclusive holidays, flights, meals, events, vouchers for goods and various other services. “We were delighted that our ‘Summer Ball’ was such a huge success again this year! Our hotly-anticipated ‘Grand Charity Raffle’ offered our staff the chance to win a selection of amazing prizes and ‘money-can’t-buy’ experiences, all donated by our very generous suppliers, and we are thrilled that we were able to raise over £11,500 throughout the evening! “Our staff have chosen to support these three very worthy causes for 2018/19, as they are close to their hearts, with many friends and family members making use of the invaluable services and support networks that they provide. Nominated and selected entirely by Fred. Olsen staff, Ipswich Winter Night Shelter, Alzheimer’s Research UK and Apostleship of the Sea will be the focus of fundraising from May 2018 until the end of April 2019. Fred. Olsen staff will take part in a host of fun activities to raise funds throughout the year, including ‘Cake Bakes’, ‘Dress Down Days’ and a very popular ‘Christmas Craft Fayre’. The Ipswich Winter Night Shelter works with local churches, local organisations and local volunteers to provide solutions to the growing problem of providing support and housing for some of the most vulnerable people in Suffolk. Its Night Shelter guests have multiple and complex issues, including poor mental health, poly-substance misuse, physical disabilities, learning difficulties, debt, broken families, long-term unemployment, trauma, suicidal tendencies and problematic housing histories. They also find it difficult to navigate the complexities of the benefits, health and housing systems. Alzheimer's Research UK is the UK’s largest dementia research charity, dedicated to causes, diagnosis, prevention, treatment and cure. Its mission is to bring about the first life-changing treatment for dementia by 2025 and the charity will achieve this incredible feat by challenging the way people think about dementia, uniting the big thinkers in the field and funding the innovative science that will deliver a cure. The Apostleship of the Sea is a Catholic charity supporting seafarers worldwide. It provides practical and pastoral care to all seafarers, regardless of nationality, belief or race. The charity’s Port Chaplains and volunteer ship visitors welcome seafarers, offer welfare services and advice, practical help, care and friendship. The Apostleship of the Sea in Great Britain is part of an international network known to the maritime world as ‘Stella Maris’, working in 311 ports with 216 Port Chaplains around the world. Roger Fern, volunteer and community speaker with Alzheimer’s Research UK (front row, 3rd from left), Clare Jessup of Ipswich Winter Night Shelter (front row, 4th from left), and Patricia Ezra, Haven Ports Chaplain for Apostleship of the Sea (4th from right), joined Fred. 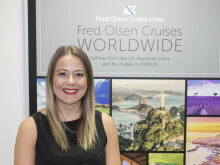 Olsen Cruise Lines’ Commercial Director Peter Deer (front row, 3rd from right) and staff at Fred. 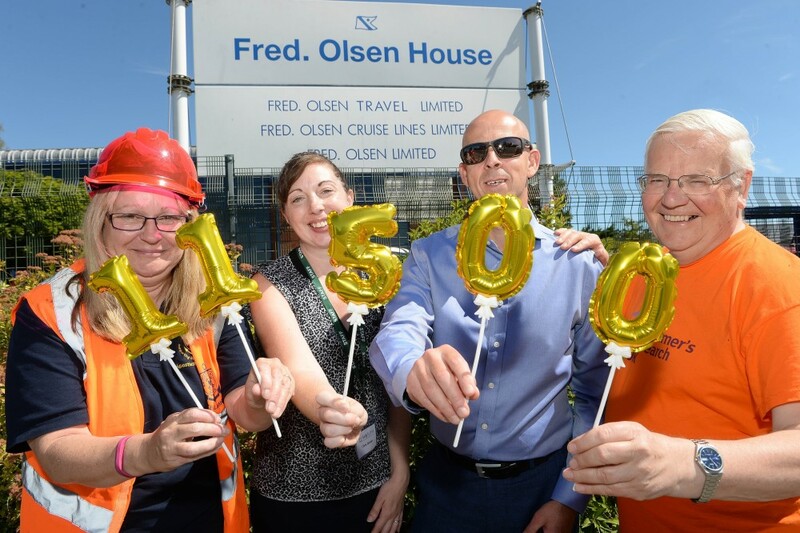 Olsen House, in Ipswich, Suffolk on 3rd July 2018, to celebrate over £11,500 being raised at Fred. Olsen’s ‘Summer Ball 2018’. To learn more about Apostleship of the Sea, Ipswich Winter Night Shelter and Alzheimer’s Research UK, visit the websites at www.apostleshipofthesea.org.uk/, www.iwns.org.uk/ and www.alzheimersresearchuk.org/ respectively.